The French Revolutionary War, like previous wars, brought renewed military activity to Guildford. In 1792 the Mayor, Mr Peche, spent 2s 6d at the White Hart while 'settling the plan for billeting soldiers'. The prejudice against barracks had considerably abated. Chatham and Plymouth were built in 1757. Sheerness in 1764. Woolwich in 1774 and a number in Ireland in 1785. In 1794 Pitt's government, under pressure of a fear of revolutionary ideas spreading from France, decided to adopt an active barracks policy. They set up a new department with a Barrack Master General and looked round for suitable sites. There were at this time 43 barracks in Great Britain with accommodation for 21,000 troops; by 1815 there were 155 with room for 17,000 cavalry and 138,000 infantry. It has been said that the barracks set up in manufacturing districts were meant as a precaution against risings similar to the French ones, but it is more likely in the case of Guildford that its position on the route to the coast was the deciding factor. 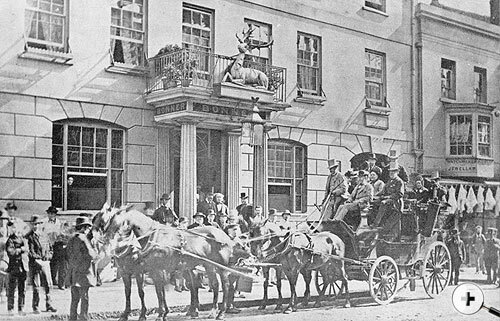 The White Hart, High Street, in the 1880s. News began to spread that the Barrack Department had its eye on the Friary Estate. Consternation was acute. Another petition was hastily drawn up, "We whose names are hereunto subscribed, Inhabitants of the Town and Borough of Guildford, having heard with concern that the Barracks for the constant accommodation of troops are intended shortly to be erected on a spot contiguous to and even forming a part of the said Borough and being convinced that manifold evils and much mischief will arise if such a scheme be carried in to effect. Do hereby (after having fully considered the measure in every point of view) signify our total disapprobation thereof and remonstrate against the same". Twenty-six names are added, including John Peche, Richard Sparkes, Joseph Pickstone, William Newland and Joseph Hockley, Town Clerk. This was a poor petition compared with the previous one and had just as little effect. The apparently surprising change of view was doubtless owing to the choice of site. An estate at Godalming would have suited them better. The Government proceeded with its plan and bought the Friary house and grounds. The house became the officers' quarters and new buildings were erected capable of holding 800 men and their horses. No plan of these buildings has yet been discovered, but study of another petition of 1812 makes it clear that the barrack range stretched from north to south along the eastern boundary of the Friary garden with its back some way from a narrow road which later became Woodbridge Road, and which was then the only exit from the town northwards at that end of North Street. 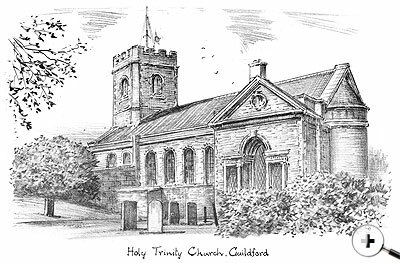 The presence of troops making a longer stay in Guildford soon was reflected in the registers of Holy Trinity Church. Entries between 1795 and 1812 show marriages of soldiers from 'Guildford Barracks', or the 'Barracks adjoining this town' or 'the Barracks adjoining this parish'. The majority of the men were described as Light Dragoons, with sometimes a Regiment of Foot or a Dragoon Guard. Their children were baptized at the church, and every year shows anything up to eight baptisms. There were also 47 burials in the churchyards of St Mary and St Nicholas between 1794 and 1803, and the Rectors raised the question of the Barracks supplying their own burial ground. No description of the buildings has yet been found and few references to its affairs. Among the Ordnance letters in the Public Record Office are circular letters sent to all barracks in 1815, 1816 and 1817 relating to the purchase of coals and straw for paliasses, and Guildford appears in the lists. The War Office records for 1794, which may contain references to the building, have not been indexed and it will require a student with much spare time to search them. The general state of barracks during the Napoleonic Wars was revolting. The rooms were overcrowded and often without fireplaces. Usually the beds were arranged in tiers and the men slept two in a bed, until the Duke of Wellington ordered separate beds. No special married quarters were provided, and married soldiers and their families had to live in the general rooms, obtaining a little privacy by hanging up blankets.' Washing facilities were almost non-existent and often the only water supply was from pumps and wells. The Guildford Barracks had good water since it was supplied by conduit, as it was to the ancient friars, from a spring in Waterden or Fox and Den Field. Food was monotonous, the same dishes being served up for breakfast and the midday meal, consisting largely of boiled meat. They had no evening meal and were almost driven to the local inns and alehouses to drown their sorrows in drink. Small wonder that the little towns like Guildford feared their advent. The local girls who married into such conditions were courageous indeed. On the other hand, the coming and going of the soldiers, during these 22 years must have added to the colour of life. Those shown in C. C. Pyne's drawing were wearing white trousers and scarlet or bright blue coats. When they rode abroad on their well-groomed horses with shining, jingling harness, all the children and many of the grown-ups would be there to gape, for this was long before the days of compulsory schooling and Guildford has always had a reputation for enjoying a spectacle. The Friary house itself, drawn by the Grammar School art master, C.C. Pyne, and published by Russell in the 1845 history of Guildford, was used as officers' quarters and many distinguished visitors were entertained there. Among them were George IV when Prince of Wales, the Dukes of York, Cumberland and Cambridge, the Comte d' Artois and Elfi Bey, a Mameluke Chief with a large retinue in splendid costumes. In his honour a public breakfast was given to the principal families of the neighbourhood. No account of the 'manifold evils and much mischief that the chief inhabitants had feared has come down to us, and Russell in 1845 was of the opinion that the Barracks had been advantageous to the trade of Guildford and the prosperity of the neighbourhood.